Fixed unit skylight A fixed skylight consists of a structural perimeter frame supporting glazing infill (the light-transmitting portion, which is made primarily of glass or plastic). A fixed skylight is non-operable, meaning there is no ventilation. Operable skylight An operable (venting) unit skylight uses a hinged sash attached to and supported by the frame. When within reach of the occupants, this type is also called a roof window. Skylights are widely used in designing daylighting for residential, public, and commercial buildings. Increased daylighting can result in less electrical lighting use and smaller sized window glazing (sidelighting), saving energy, lowering costs, and reducing environmental impacts. 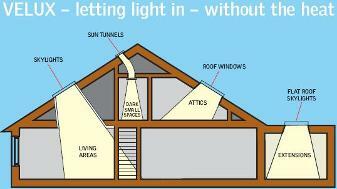 Daylighting can cut lighting energy use in some buildings by up to 80%. Toplighting (skylights) works well with sidelighting (windows) to maximize daylighting: toplighting is able to bring light into centralized areas of a building daylight is available throughout the day from both ambient lighting from the sky and direct exposure to the sun. modern transparent and/or translucent glazing can be utilized to avoid glare, aid in capturing sunlight at low angles and diffuse light to wider areas of floor space. Materials Glass Many recent advances in both glass and plastic infill systems have greatly benefited all skylight types. 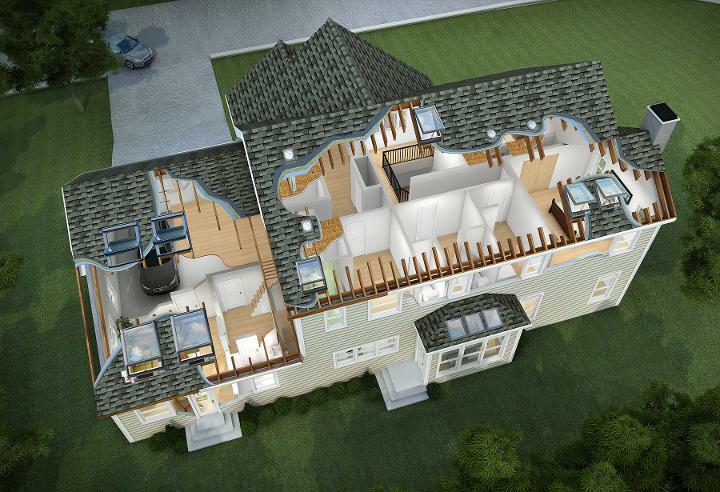 Some advances increase thermal performance, some are focused on preserving and utilizing daylight potential, and some are designed to enhance strength, durability, fire resistance and other performance measures. Contemporary skylights using glass infill (windows) typically use sealed insulating glass units (IGU) made with two panes of glass. These types of products are NFRC-ratable for visible transmittance. Assemblies with three panes can sometimes be cost-justified in the coldest climate zones, but they lose some light by adding the third layer of glass. Glass units typically include at least one low emissivity (Low-E) coating applied to one or more glass surfaces to reduce the U-factor and especially SHGC by suppressing radiant heat flow. Many varieties of Low-E coatings also reduce daylight potential to different degrees. High purity inert gas is frequently used in the space(s) between panes, and advances in thermally efficient glass spacing and supporting elements can further improve thermal performance of glass-glazed skylight assemblies. Plastic Plastic glazing infill is commonly used in many skylights and TDDs. These assemblies typically contain thermally formed domes, but molded shapes are not uncommon. Domed skylights are typically used on low slope roofs. The dome shape allows for shedding of water and burning embers. Plastics used in skylights are UV stabilized and may feature other advances to improve thermal properties. Lack of accepted standards for measuring light transmittance is a disadvantage for comparing and choosing skylights with plastic glazing, Acrylic is the most common plastic glazing used for dome skylights. However, Polycarbonate and Copolyester materials are also used as glazing, where additional properties such as impact resistance may be required.